Featured April 17, 2015 September 5, 2015 Efrat Ginot Ph.D.
“Efrat Ginot’s remarkable new book shatters our long-held view of the unconscious as a repository for unwanted experience. In this absorbing volume, Ginot deftly displays her extraordinary ability to understand the human brain and simultaneously ground decades of neuroscience research in everyday human experience and clinical practice. The Neuropsychology of the Unconscious is unique in its application of brain science to the passionate pursuit of empathy and transformation. As someone who works with hypnosis in a clinical setting I find myself constantly inundated with theories of ‘the unconscious mind’ many of which are subpar at best. 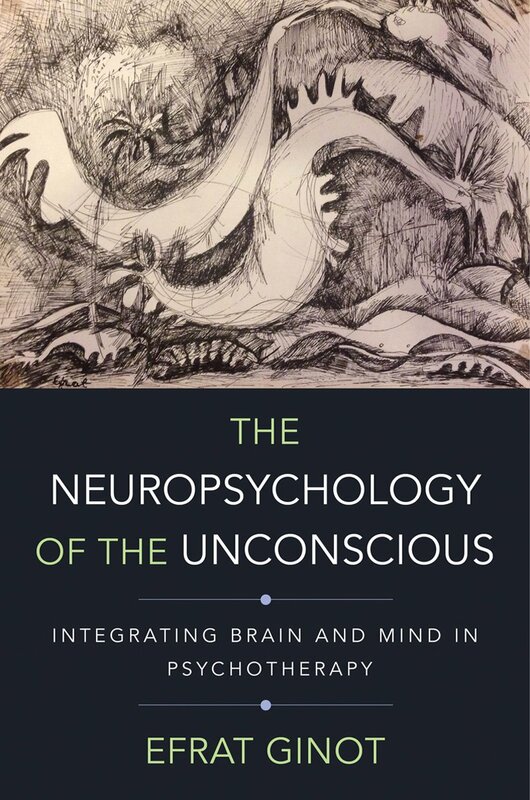 This book combines neuroscience with a relational psychoanalytic perspective to present a fresh view of the unconscious. Grounded in solid theory and practise this book is a must read for anyone with even a passing interest in the subject. I will be re-reading it multiple times. Buy it at W. W. Norton and Company Inc.
Dr. Leanne Domash: The book came out of the question – why is it so difficult to change. How do we begin to understand this? Doing this work we often encounter how difficult it is for patients and for ourselves to modify how we deal with dysregulated affect or avoid repeating behaviors that don’t work. I am not talking here about stimulus-response learning in a simplistic sense. The encoded patterns are complex, nuanced and spread out. Emotional memories, interpersonal experiences, our unconscious interpretations of events, unconscious associative learning, and many “conclusions” as to our self-worth coalesce into unconscious maps. In essence, an unconscious map reflects every child’s attempts to give meaning to what is happening inside and out. A punitive parent’s behavior, for example, will still be justified. The child has no capacity yet to see the parent with the needed clarity and with a reality-bound perspective. A part of the child, as Braten said, is always immersed in the parents’ self-states, identifying with them and imitating them. As a result, negative feelings such as shame and humiliation experienced by the child, will be perceived by him as emanating from him and not the result of the parent’s verbal shaming. We often see this in patients who in states of dysregulation revert to very negative emotions and narratives about their self-worth. Dr. L.D. But why are they so entrenched? The general answer lies with evolutionary pressures for adaptation and the ways that these demands shaped the way our brain/mind works. Prior to full consciousness, as some neuroscientist believe, it was important for early humans to rely on quick responses, on memories that guided them without much effort or thought. It was important to act quickly. As a result, the brain developed the propensity toward the automatic enactment of established learned patterns. As we know, the prefrontal cortex is relatively new, while the subcortical regions establish and enact all learned patterns automatically and out of awareness. In addition, all learned patterns are embedded in early emotions emanating from subcortical regions. Emotional memories make a stronger impact and strong emotions strengthen encoded maps. Dr. L.D. : In the book you put the unconscious on a flexibility/rigidity continuum. Is this a characteristic of unconscious processes that explains our obstacles to sustained change? Is it more difficult for some people than for others? We need to remember here that we cannot talk about the unconscious without its relationship to consciousness. A person that displays seemingly rigid patterns of behaviors, for example, repeating the same interpersonal mistakes, is most likely guided by a rigid unconscious system which interprets reality only according to what it knows. A rigid system does not learn from reality and does not take different or new elements into account; influenced by subcortical regions that in turn affect the prefrontal cortex and its capacity for flexible judgment, it mainly relies on familiar systems. Deconstructing such a way of seeing the world, understanding it and being mindful of it is certainly one of the more important therapeutic goals. L.D. Yes, it seems to me that this applies to one of the goals of therapy– helping people become more adaptive to changing circumstances. How is this achieved in therapy? E.G. If we identify and define change as the ability to modify the ways we automatically organize the world, the way we can regulate affect and challenge distorted narratives about ourselves, therapy is among the few human endeavors that can achieve it. Almost every form of therapy sees change as its goal. Psychoanalysis has focused on interpretations and insight that we now know may not enough. Although most therapeutic approaches offer rich internal and interpersonal experiences, a more advanced understanding of the brain/mind indicates that undergirding the patient’s ability to attain and sustain emotional and behavioral change is the ability to engage in of reflective awareness – what used to be called the observing ego. Based on what we know, however, this observation is not just a momentary insight; such a process is not sufficient to induce change in very stable neural circuits. What seems to enhance the process of change is active reflection on affect and behavior in real time. The more a patient becomes aware of her emotional, cognitive and interpersonal patterns, the more her psychic flexibility and behavioral grow. Such active engagement with one’s reflective awareness needs to occur both within sessions and in life outside of them. Encouraging the patient to reflect in real time in moment of dyregulation, giving her homework, addresses one of the fundamental obstacles to change. Namely, without continual practice it’s hard to shift established patterns. To strengthen the flexible arm, we have to pause before the automaticity takes over. This is a taxing and difficult process because it involves the necessity to experience one’s feelings and negative cognitions about the self while at the same time not acting on them in the usual way. LD: Can you give me an example of a patient’s newfound ability to pause, experience and reflect? EG: This ability to stop and reflect is the beginning of a complex process of change. As we saw, one of the hallmarks of brain processes is the tendency to perceive, think, feel and act according to established patterns. For example, Ms. A often feels slighted in in large groups. Somehow, she leaves such a gathering feeling certain that the hostess or other friends were not very warm to her. She often feels rejected by others. Without ever questioning the certitude of her feelings and thought, A, Is convinced that unless her friends pay full attention they are being dismissive of her. She is often disappointed with them saying to herself that she would never be so unfeeling; she would make sure everybody feels very welcome. Of course A. is reacting to real stimuli in the environment, the hostess is busy attending to many things and people, and others may not be as attentive as A. would have liked. But without reality-bound perspectives, A.’s interpersonal entanglements and internal torment are determined by an internal map and the perceptions, emotions and they cognitive conclusions it automatically triggers. Without a greater awareness of the relational origin for such perceptual tendencies A. most likely will continue to feel convinced of the rightness of her emotional reactions interpretations of events. We can see in this case, how “homework” might help A. reflect on her emotional state when in an actual party. Dr. Leanne Domash: Why did you want to tackle the subject of the unconscious? Dr. Efrat Ginot: My curiosity about unconscious processes arose from three decades of therapeutic work with a wide range of people. During these years, persistent questions arose: Why are we so susceptible to experiencing dysregulated self-states, to bouts of anxiety, depression, and negative feelings about ourselves? For example, in spite of life-long histories of adaptive and effective functioning, why do so many of us at times nevertheless feel self-doubt, low self-esteem, minimize our achievements and fear immanent failure? Why do we continue to engage in self-defeating patterns of feeling, thinking and acting? Why do we do this even when we consciously identity a particular pattern and are determined to avoid it? Why do some of us repeatedly choose relationships that don’t work and in fact cause a great deal of suffering? Why do fears have such a grip on us, so often pushing us towards maladaptive avoidant behaviors? And why is the emotion of fear and the defenses it engenders so resistant to change? Most importantly, why is it so hard to change such patterns and even become aware of them? Even in therapy, the work of changing what no longer works is hard and time consuming. Insight in itself is rarely sufficient. And even as the patient’s emotional wellbeing and behaviors change, old patterns still pop up, especially during emotionally stressful times. LD: Why did you turn to neuroscience as the field that might provide some answers? EG: It seemed to me, then as now, that something fundamental to the way we are built must be at work; processes driven by our brain/mind’s evolutionarily determined functioning. As therapists we deal with people’s minds, but minds are embedded in brains, and it became exceedingly clear that we cannot understand why we do things without a better grasp of this relationship between brain and mind. Delving into the neuropsychological literature indeed pointed the way towards a greater understanding of how our unconscious brain/minds underpin much of our difficulties as well as our wellbeing. The integration of neuroscience with therapeutic experiences presents a new way for understanding the unconscious, its ever-present and global impact and the way existing patterns are automatically enacted and repeated. By integrating my clinical experiences with findings in the various branches of neuroscience, I was able to develop an integrative model of the unconscious. This new model suggests that repeated emotional difficulties, negative self-states and behavioral patterns that no longer work for our wellbeing are not the result of willfully or unconsciously holding on to negative states as a way to attain secondary gains. By the same token, peoples’ difficulties with the process of therapeutic change do not stem from a simple defensive resistance to change or an unconscious fear of it. Only our neurobiology could offer good enough explanations for such tendencies and phenomena. The answers to why people automatically and often out of awareness persist in behaviors that hurt them and others could only be found in the specific nature of brain/mind characteristics. As I was considering this, some influential writers and researchers also pointed the way towards integrating neuroscience and our clinical understanding of the unconscious. Allan Schore’s outstanding work on the importance of the right brain in unconscious communication and co-constructed regulation between infants and caretakers, patients and therapists is a good example. Joseph LeDoux’s ground breaking contribution concerning the role of the amygdala in fear learning is another. Damasio’s and Panksepp’s work on emotions as well as Koziol’s work on the subcortical dimensions of cognitive functioning are also central to a new formulation of the unconscious. These are just a few of the researchers that have opened the door toward a new model of the unconscious. LD: So how does neuroscience contribute to a different understanding of the unconscious? EG: What neuroscience has opened up for clinicians is a deeper understanding of how unconscious patterns are created and maintained and how pervasive they are. From the very beginning of life the interactions between the brain and its specific environmental conditions give rise to a host of unconscious systems that comprise amalgams of memories and experiences. These experiences, the responses to internal or external characteristics and pressures, become the building blocks of our repeated patterns and conscious sense of self. Most of the new understanding on how the brain/mind developed automatic, fast and entrenched systems based on encoded learning and memory is embedded in our evolutionary past. In order to survive, the brain had to develop quick ways of responding to the environment. Based on a great deal of research, neuropsychology has demonstrated the brain/mind’s tendency to automatically repeat and enact such early patterns. This tendency is the result of our evolutionary past. Storing information and memories important for survival and wellbeing were quickly and automatically used so that we didn’t need to relearn how to survive each time when confronting similar situations. The brain/mind also developed mechanisms with the goal of preserving our sense of wellbeing. These functions alone can explain how learned responses and memories become encoded, entrenched and then reactivated in response to similar stimuli. When activated in a specific, familiar context, these old patterns — constituting amalgams of affects, memories, associations, and cognitive interpretations of internal and external reality – are automatically enacted. This happens fast and mostly out of our awareness. In this way pervasive unconscious processes affect all our mental functions, from perception, expectations, unconscious predictions, affective responses, cognitive evaluations and response tendencies. It is also important to realize that although the “content” of these incalculable experiences and memories is mostly not accessible to conscious awareness, they are revealed through all of our mental activities, consciousness and actions on the environment. The systems encoded in the brain/mind embody the integrated activities of all brain regions; subcortical, emotional and prefrontal. As a result they put unconscious processes on a continuum between the conscious and the unconscious. Unless we become aware of them they will continue to be unconsciously and automatically enacted. LD: In this context, how have accepted concepts such as repression, been challenged or modified? EG: Based on neuropsychological findings the unconscious is no longer seen as the container for id material or stormy experiences and memories that have been repressed because they threaten one’s conscious sense of self. Rather, unconscious processes are operating at all times and give rise to unconscious patterns and to our conscious experience as well. In this context, as I mentioned earlier, the unconscious can be seen as occupying a continuum — from inaccessible clusters of memories and associated learning to a consciously experienced sense of self. Unconscious patterns are stored and activated by a complex dance between subcortical areas such as the cerebellum and the basal ganglia, the amygdala, and regions in the prefrontal cortex. Based on the stored systems of procedural know-hows and relational patterns, unconscious self-systems respond to the world in specific and predictable ways – again a result of evolutionary necessity. Existing patterns of responding to internal and external stimuli become reinforced and therefore entrenched. Consequently, the responses to any environment are based on what the brain/mind already knows. In this way, unconscious processes determine how we perceive, feel about, think about and basically interpret our internal and external environments. Why do some people seem to enact unconscious patterns more often and with more rigid characteristics? A further continuum that describes unconscious processes is the continuum of rigidity-flexibility. Again through evolution we had to develop the ability to perceive a changing environment in fresh and helpful ways. If we were to react only with old learned responses that do not fit the new environment we would not survive. To function optimally in an ever-changing world we need to employ both the old and the new. In response to environmental demands – internal as well as external — we need to be able to quickly and unconsciously move between the two systems; the reliance on already reinforced patterns and perceiving what is new in a situation and what appropriate, reality-bound responses it call for. If subcortical systems overtake cortical areas only old patterns will prevail. If the wheel has to be reinvented each time anew, we lose much of our ability to act smoothly and effectively. Some patients, as we often see in our clinical practice, are overly dependent on old ways of responding at the expense of their wellbeing. This exemplifies when projections and being stuck in one’s old ways of interpreting the world are not adaptive. Such patterns may have worked as adaptive mechanisms in the past but have long since lost their usefulness. This rigidity is not volitional or purposeful but rather the result of old and inaccessible memories, affects and the defenses against them. LD: What are the clinical implications of this expanded view of unconscious processes? EG: The intersection between neuroscience and psychotherapy offers us not only new ways to understand human difficulties but also points to more active ways of addressing them. More specifically, a different understanding of how unconscious processes work and how they affect so much of who we are and what we do have many clinical implications. We no longer think of the unconscious as the container for repressed memories, memories and experiences that are waiting to be unearthed in therapy. Rather, and paradoxically, we see the unconscious everywhere, in thoughts, feelings and actions. I say paradoxically, because most of what resides in our unconscious maps and self-systems can never become conscious. Rather what we can become aware of are their enacted manifestations; in what we do or don’t do, how we feel and how we relate others. The understanding of unconscious processes eliminates guilt and the feelings patients may have about not being strong enough to fight their difficulties on their own. By getting a sense of how brain/mind processes work they can become more empathic with their struggles and unintended repetitions. The patient’s understanding of the role of the amygdala in his recurrent anxiety for example, can lead to a detailed inquiry of childhood experiences that might have given rise to such fears, and how the unconscious activation of the amygdala contributed to them. Again, as the amygdala’s activity occurs largely out of awareness, patients may be open to purse self-awareness and self-understanding without feeling that they failed in controlling fears. Patients can be less defensive as they struggle to get a clearer picture of early-encoded memories and the distorted interpretations and meaning they may have attributed to them. Unfortunately, several processes combine to cause a young child to assign meaning to internal and external experiences that are weighted in the direction of self-blame and self-denigration. Feelings of shame or distress, for example, are not seen as resulting from the actions or words of an unempathic adult, but as signs that indeed one is not worthy. Similarly, because of the innate tendency to experience parents’ words, affects and actions as emanating from one’s own internal world, the process of identification, the child will internalize many fears, anxieties and self-doubt that are not his to begin with. Only later, especially in therapy, can such emotional and behavioral patterns be identified, deconstructed and understood, allowing the patient to develop his own ways of seeing himself and others. But most importantly, the understanding of how unconscious patterns tend to be automatically enacted strengthens the centrality of our analytic work. Realizing that we all enact unconscious patterns (with varying degrees of awareness) means that we want to better identify and understand theses patterns and how they interfere with one’s life. The intertwined interaction between affect and cognition – a major characteristic of brain/mind functioning – also makes clear that while pursuing change in one’s typical way of feeling, thinking and relating, emotional memories and affective states have to be present. As a great deal of the building blocks of an unconscious pattern is comprised of emotional memories, without the presence of affect change is difficult to achieve. As clinicians we have always known this. The emotional urgency that accompanies transference-countertransference interactions have been a corner stone of various treatment processes. The understanding of the inextricable connection between affect and cognition, however, opens other therapeutic doors. We, know that an optimal balance between subcortical and cortical regions results in more adaptive affect regulation. Consequently, recruiting the prefrontal cortex during time of affective dysregulation may help patient to acquire better regulation. Enhanced regulation can be achieved by practicing mindfulness, for example, in real time, when emotions and negative thinking take over. More importantly, it powerfully develops through the therapeutic work, within the affective co-regulation between patient and therapist. The therapist’s capacity to contain affect, to be empathic gets internalized by the patient as well. Dr. Leanne Domash is a psychoanalyst who focuses on a better understanding unconscious processes, especially how they are expressed in dreams. Buy “The Neuropsychology of the Unconscious” here.